You say, awwwww. That's cute. 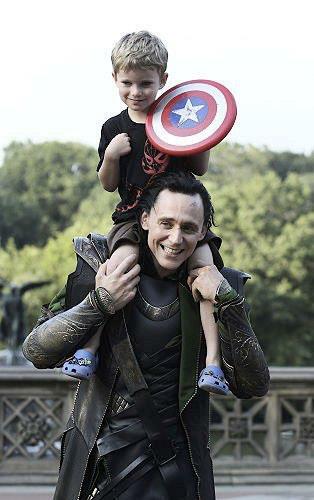 A Captain America mini-me sitting on top of Loki's shoulders. Awwww. And if that's all you have time for, so be it. Enjoy your day. But if you have time for the whole story, then you need to head on over to GeekWatch and read the epic tale of how Edison got on the set of the Avengers with his mom and met the entire Avengers cast, including Chris Evans' mom. And then the pic hit the Internet and Edison became a celebrity. And then he went to Comicon and people asked to take pictures with HIM. How awesome is that!? An EPIC tale, indeed. It's completely incredible (and also incredibly long) but so well written. I highly suggest that you head on over on your coffee break and take it all in.